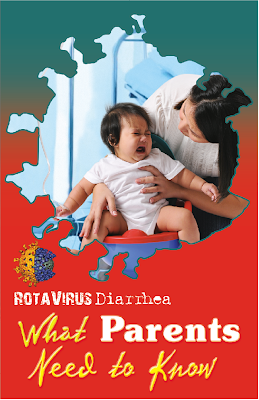 Diarrhea can be real serious problem that it may be infected with deadly Rotavirus. ROTAPhil, A health advocate group gives the real deal on this potentially fatal disease in a handbook entitled The Rotavirus Disease: What Parents Need to Know. The handbook unveils important facts about Rotavirus what concerned parents need to know in combating the number one cause of death due to diarrhea among children around the world. It discusses symptoms of Rotavirus infection such as diarrhea, fever and vomiting—all of which can happen in children, especially aged five and below, from across the socio-economic spectrum. Because of its non-discriminating nature, Rotavirus has been dubbed by health experts as a “democratic disease,” causing more than 600,000 deaths yearly among children from both developed and developing countries. This campaign event against the rotavirus disease was held on October 21, 2009 at National Bookstore, Greenbelt 4, hosted by celebrity Suzi Entrata-Abrera. “One of the purposes of the handbook is to make parents aware that Rotavirus may be present in one’s hands or virtually any surface and can strike their unprotected child at any place, and any time,” says Dra. Ma. Lourdes G. Genuino, Assistant Secretary of the Philippine Society of Pediatric Gastroentology and Nutrition. Dra. Lulu Bravo, Vice-Chancellor for Research at the University of the Philippines Manila and Executive Director of the Philippine Foundation for Vaccination, explains that the handbook was especially developed by health experts from ROTAPhil, in partnership with global pharmaceutical company GlaxoSmithKline, to guide parents on how to deal with children infected with Rotavirus and how to take proactive steps such as vaccination in order to protect their children from possible infection. “Through ‘The Rotavirus Disease: What Parents Need to Know,’ we hope to advocate action leading to a reduction and gradual elimination of the rotavirus disease,” emphasizes Bravo. Indeed, in the world of diarrhea, the need for prevention can never be overemphasized. As front liners in championing children’s health, parents should arm themselves with the most powerful ammunitions against this enemy. In the battle against Rotavirus, there can’t be anything more potent than getting to know your enemy and attacking it where it is weakest—through vaccination. In the Philippines, global pharmaceutical company GlaxoSmithKline offers a vaccine as a means for protection to infants and young children against the adverse effects of Rotavirus diarrhea. In fact, it was found that eight out of 10 babies who are immunized will not come down with the dreaded disease and almost 100% of them are protected from severe rotavirus diarrhea requiring hospitalization. Rotavirus infection is the leading cause of death due to diarrhea among young children worldwide. Be one of the proponents in protecting the Filipino children against this fatal disease. If you want to request for a free copy of The Rotavirus Disease: What Parents Need to Know handbook, just send an email to rotaphil@gmail.com.